SharePoint has always had fantastic built-in support for metadata, but many organizations have not yet harnessed the power of metadata to build new efficiency, productivity and security into their business. This post is the second in a series that will take us on a tour of what metadata is, how organizations can take advantage of its benefits and the SharePoint 2013 features that support it. 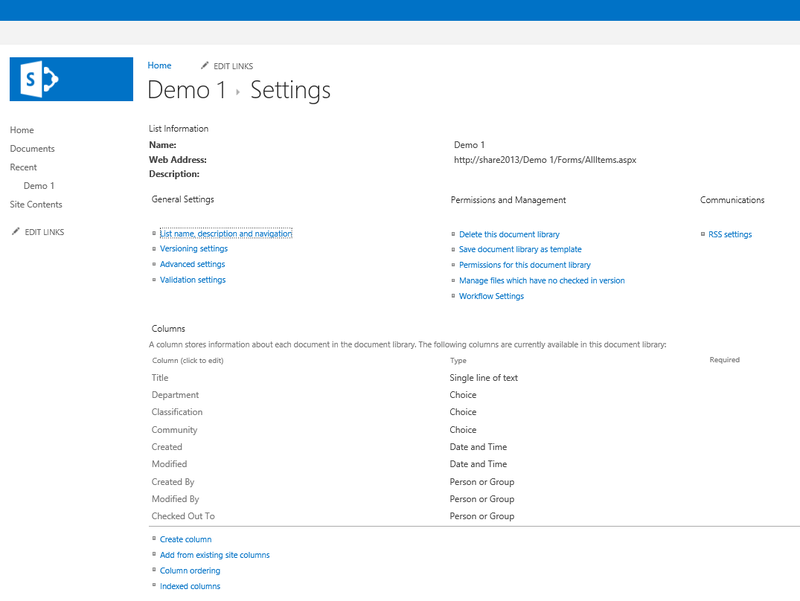 In SharePoint when end users upload a document to a library or add an item to a list, a number of columns will appear beside the document or item – those columns are how SharePoint represents metadata fields. Several columns are added by default, like date last modified, last modified by and file type. Administrators or those with sufficient rights can also add custom columns for various purposes. As mentioned above, metadata fields are sometimes referred to as tags, but they can also be referred to as properties. For a single line of text the maximum characters available is 255 characters. If you need more characters entered for a metadata field then use a 'Multiple lines of text' column type, which allows for up to 2 GB of character data in a column value (that's 1,073,741,823 characters). That said, although it is possible, it is not advisable to store such large amounts of text in a metadata field value as it could hamper overall performance. This allows you to specify a formula that is used to validate the data entered whenever a new metadata field is populated for an item in the library or list. This can be particularly useful when entering numerical data, in order to apply some checks to the data entered. You can even specify the message shown to the user I they should enter a value that doesn't pass validation. Some great help is provided on the link shown in this section regarding the syntax to be used in specifying a formula. 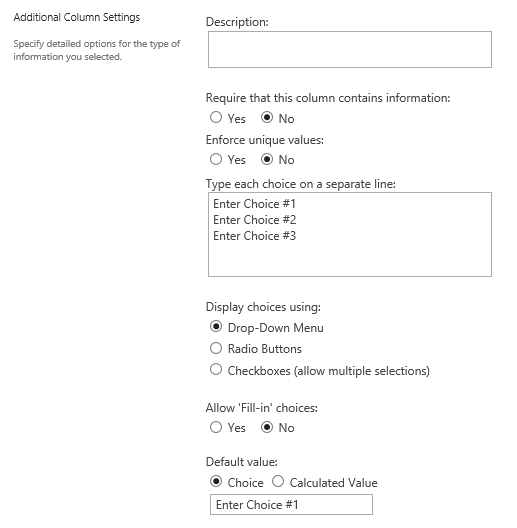 Alternatively, to add a new or edit an existing column, you can click 'Library Settings' on the SharePoint ribbon. A list of all existing columns will be displayed. From here you may select an existing column to edit or add a new column as well, which will take you through similar windows to those shown above. Again, accessing and modifying these settings is pretty easy. Its just a matter of working through the various options available and Microsoft has provided a lot of control over these particular settings. 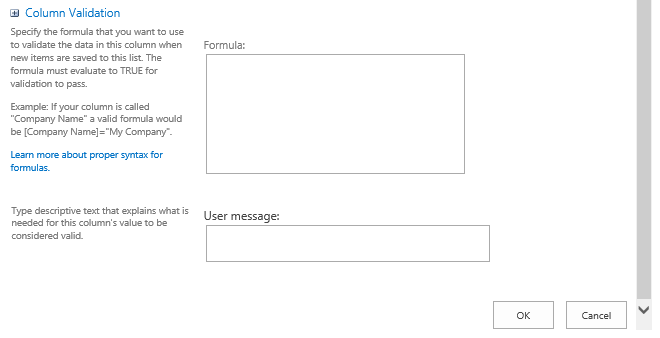 In order to configure metadata fields on a SharePoint library a user must have the ‘Manage Lists’ permission on that library. The ‘Manage Lists’ permission depends on also having the following permissions on the library: Manage Personal Views, Open, View Pages and View Items. These permission are by default given as part of the ‘Design’ and ‘Full Control’ permission levels, so if you have these permission levels on the library you should be able to add, remove or edit columns (or metadata fields) on a library. Of course, a ‘site collection administrator’ or members of a ‘site owners’ group are able to perform such configuration by default. Each column once created will take up a certain number of bytes and this will vary based on the column type. The threshold shown ultimately comes down to the fact that the sum of all columns in a SharePoint list cannot exceed 8,000 bytes. Depending on column usage or which types of columns are created, users can reach the 8,000 byte limitation before other limitations are exceeded. For a full explanation how these limits are calculated, please visit the Microsoft SharePoint 2013 Software Boundaries and Limits page and read the section on Column Limits. 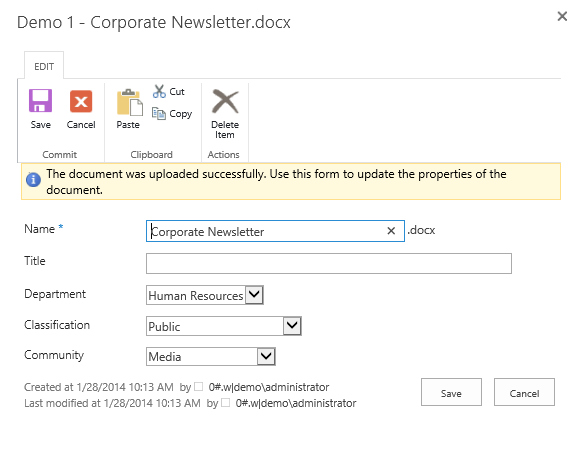 When adding Microsoft Office documents like Word, Excel and PowerPoint to SharePoint, metadata that is stored within those files can automatically be added to SharePoint metadata columns. 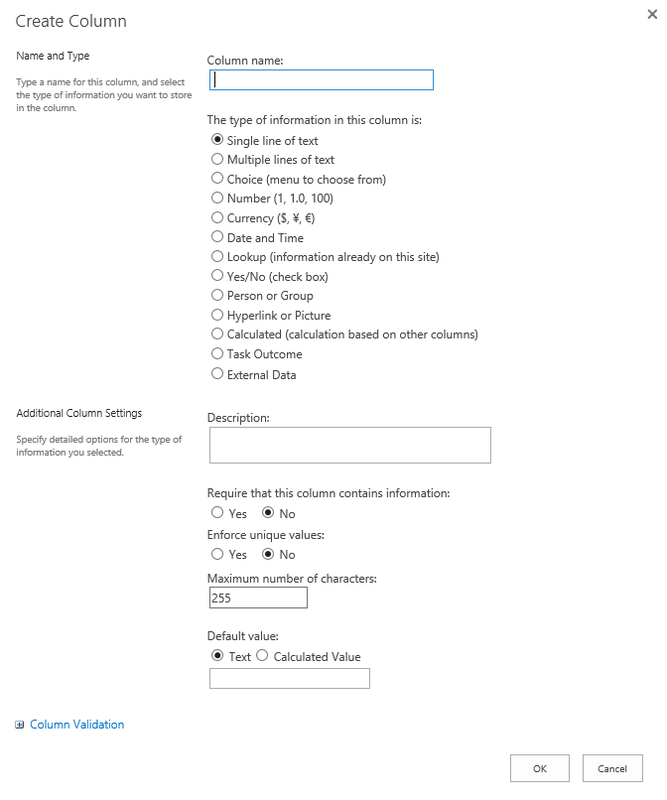 This occurs for the default metadata columns mentioned, but it can also occur for custom metadata columns in SharePoint. It only works with certain Microsoft Office formats, namely Word, Excel and PowerPoint. This does not work for PDF files or other formats. SharePoint only checks the ‘Document Properties’ fields (docProps section) within these Microsoft Office file formats. It does not check any of the Open XML Document format fields (customXML section). If you have 3rd party solutions storing metadata in MS Office files, ensure that the metadata is stored in the correct section of the file. The SharePoint metadata column must have its named configured to exactly match the metadata field within the file, and this must be done when the column is created. You cannot take an existing metadata column and rename it to match the metadata field. If you make a typo, you must delete the column and recreate it. This feature does not work if Information Rights Management is configured on the library. Often when working with Microsoft Office files metadata will automatically be added to the file, like the name of the document’s author, language or creation date. Third party solutions integrated with Microsoft Office can also add metadata to our documents automatically. This is a great feature for automatically populating metadata within SharePoint for the most common file formats that we work with. This post has covered how to work with metadata using several of the basic built-in metadata features within SharePoint. They are not complex, but for those new to SharePoint many of the concepts are new. These features will be covered future posts. For now, I hope you enjoy working with metadata within SharePoint using the features described here. Your feature above, Auto-Populating SharePoint Metadata: Property Promotion -- I simply am not getting this to work. I have followed your instructions exactly, yet the SharePoint metadata field is NOT being populated with a named field (of the exact same name) within an Excel spreadsheet. Quite frustrating. I have been trying to figure out why one column wouldn't populate. Deleting and recreating solved it. The tip about typos is priceless.